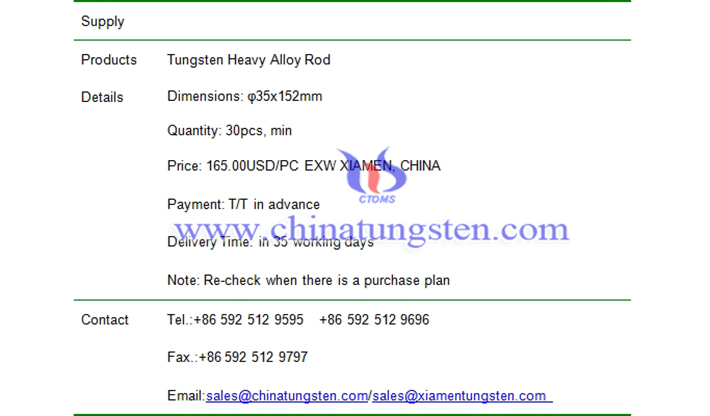 φ35x152mm tungsten heavy alloy rod price is 165.00USD/PC on Feb. 21, 2019. The composition of the bar is 90WNIFE with density of about 17g/cm3. Its size conforms to international standard ASTM B777. We offer a growing range of WHA rod diameters that can be cut to size to customer specified thickness, length, surface finish. We also offering precision machining threaded rod and gun-drilled rod.